Drawn by oysters and wild ponies, not to mention uncrowded beaches, Virginia’s Eastern Shore becomes a solid choice for a summer getaway. The peninsula includes 23 undeveloped barrier islands and a chance to experience the engineering marvel of the 23-mile long Chesapeake Bay Bridge-Tunnel. I approached from the Norfolk area after visiting Williamsburg, Yorktown and Jamestown, known as the Historic Triangle. Driving through the Bay Bridge-Tunnel, built from 1960-64, deposits you onto a road that stretches like a spine from Cape Charles in the south to Assateague Island to the north. The top half of Assateague belongs to Maryland. Chincoteague is the most popular destination on the Peninsula and must be doing something right because the spot has won happiest town, friendliest seaside town and other lifestyle awards over the years. The plethora of ice cream stands may help the voting. My cone from the Island Creamery earned rave reviews. 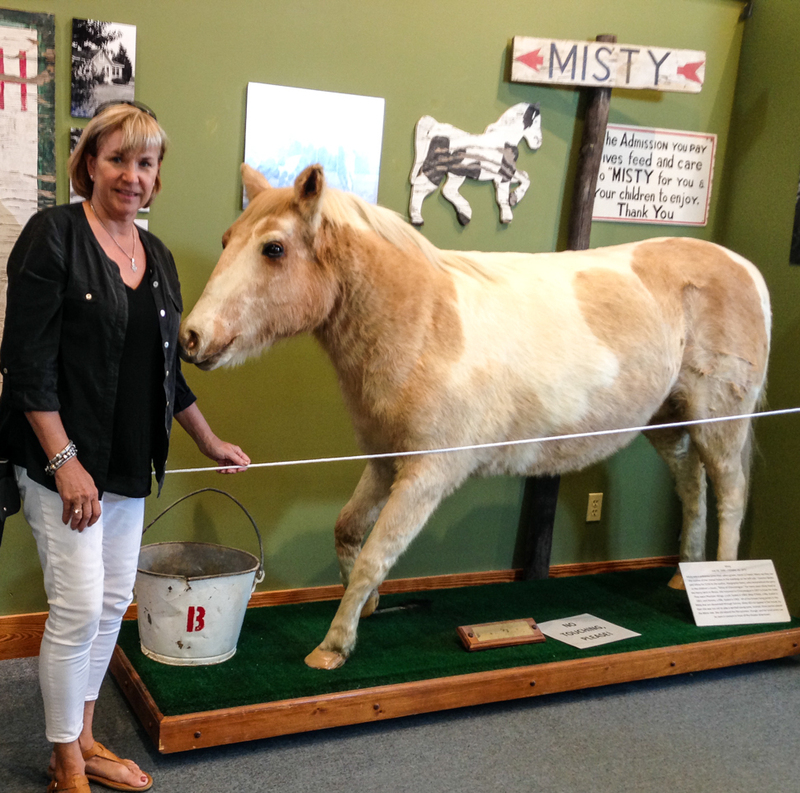 If you grew up on Newberry Award-winner Marguerite Henry’s books and fell in Love with “Misty of Chincoteague,” the Museum of Chincoteague will be a must stop. The famed horse stands as a stuffed display with Stormy, her third and last foal. The Museum isn’t much more than a photo op and a quirky one at that, but Misty fans shouldn’t skip. Very doable with kids. Oysters from the Eastern Shore also garner extraordinary kudos. Don’s Seafood is my recommendation. 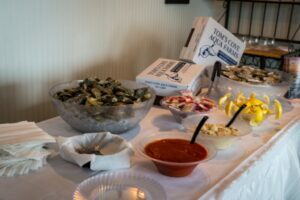 The oysters served at Don’s are grown at Tom’s Cove Aqua Farms based on the island. To see the wild ponies, you need to visit the Chincoteague National Wildlife Refuge. Stop by the Assateague Island National Seashore Visitors Center at Little Toms Cove, and then drive along the Wildlife Loop Road. From there, hopefully, you’ll catch a glimpse of the ponies on Assateague Island. The popular myth is that the wild horses washed ashore from a capsized Spanish galleon, but genetics indicates they were of domestic stock and were placed on the islands to escape a livestock tax. The ponies proved tough enough to survive scorching heat, abundant insects, stormy weather and poor quality food. I had the opportunity to meet Denise Bowden, the first woman accepted into the Chincoteague Volunteer Fire Company, and now director of Public Relations. She explained that the fire company owns and cares for over 150 Virginia-bred but free roaming horses that produce from 60-90 foals per year. According to Denise, the Chincoteague firemen have auctioned off young ponies as a way to control the size of the herd since the early 1940’s. The money is used to purchase and maintain firehouse equipment. Today the average price for a pony at auction runs around $2,700. The annual roundup is an immense event for the little town. The population of 3,000 grows to over 50,000 with visitors. 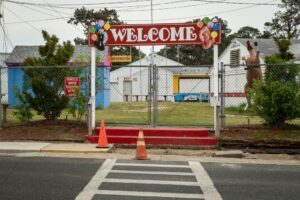 The calendar calls for the swim from Assateague to Chincoteague, Pony Penning, auction and carnival on the last consecutive Tuesday and Wednesday of July. The preliminaries – rounding up the herds, walking them to the assembly area and checking the ponies for health fills Saturday through Tuesday. The swim takes place on Wednesday, this year the date is July 29, 2015. The auction runs on Thursday. On Friday, the remaining herd swims back to Assateague for another year.